This is perhaps the strongest August storm on record---certainly the most impressive in my memory. Here are the maximum winds during the 24h ending 9 PM Saturday. 87 mph at Destruction Island on the central WA coast. Lots of 60-70 mph gusts from Everett northward, with 40-50 mph being common over the rest of the region. And here is a close-up view of the Puget Sound area. Note...the zero winds should be ignored. Nearly a half million folks lost power...perhaps the biggest wind-related August blackout in regional history. Why so many without power? Strong winds, first storm of the season, and dry conditions (which appear to make trees more susceptible to limb loss). Want to see something really amazing? 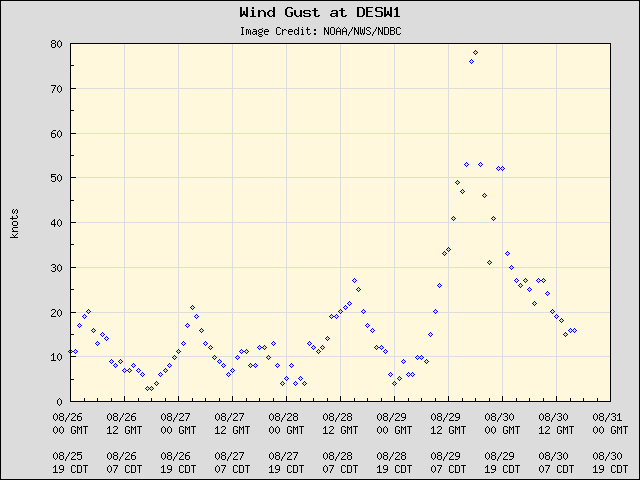 Here is the maximum hourly gust at Destruction Island. It peaked at 78 knots. That is NINETY MILES PER HOUR. And what about precipitation? Here is the 24h amounts for the same period. OVER 4 inches over the SE side of the Olympics, with1-3 elsewhere over that range. This will have a huge impact on the drought conditions there. 1-3 inches over the north Cascades,which will help knock back of the fires in that area. Heavy amounts over SW Washington. But it is NOT over yet. A large band of very heavy precipitation is now over western Washington (see radar). And the forecast precipitation for the next 48h is considerable (several inches) over the Olympics and North Cascades (see map). And plenty more rainfall after this period. Thanks for the great weather updates Cliff! This mornings satalite imagery really solidified my own, internal, weather forecast. I knew we were heading for trouble. 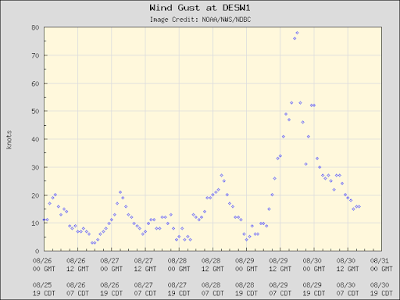 What I found interesting, well most interesting, is the winds went from a near calm, to storm force in less than an hour. I had a 10AM appt. at the UW. I arrived in sun and calm winds and at 11AM I left in 70 degree warmth and a maelstrom of wind. I believe tree were vulnerable due to their tissues being dry and brittle. I also noticed no mention of the storms aftermath on weather.com. I really enjoyed this storm though I'm sorry that two people lost their lives, including a 10-year old girl in Federal Way who was killed during an outdoor birthday held during an opportune sunbreak. (She was struck by an alder limb). Here in East Bellevue, 210' elev., we had several 10-minute periods where the rainfall rate was 0.56"/hour and we clocked a 39 mph gust from the SW. That's weak beer for November, but it's the real deal for August, especially after the past six months! I hope you'll post on Monday with a summary of where the weekend totals put us against an average summer's worth of precip; my guess is we're coming up pretty close to normal, and maybe we'll even go over. Was there enough rainfall anywhere to our east to help the reservoirs? It looks like the wind storm was just at low elevations. The map shows that the top of the Olympics and Cascades had no wind. Major wind event in north Whatcom County, where we're still without power 24 hours in. What's surprised me is how little precipitation we've had along the way ~ definitely nothing akin to what was forecast. And still not much on the horizon. Which leads me to wonder, are we going to come out of this high & dry? April rain and wind in August. We will gladly take it. Thanks Cliff for the summary. These types of windstorms are notable because of how clear the skies are as the storm ramps up and their suddeness -- I remember one like this in a past November where it was sunny even during the height of the wind storm. I think it must have been a Scorpion's tail/low pressure center passing offshore as well. 1.30" and counting for the weekend here on Bainbridge Island. Looks like Whatcom County must have missed out on much of the precip. Great rundown Cliff. Another factor regarding trees is that the deciduous trees still have their leaves, creating even greater pressure on heat stressed limbs and branches. Bigger sails (lots of leaves), bigger boom. Cliff, I see that as of this morning, so with more 24 hours to go, we have had the first August in the record with two top tier wet days and enough rain that we're the 5th wettest August on record. The models seem to be suggesting that, with a possible break next weekend, the unsettled pattern could resume next week. Don't you love that "nature's" algorithms don't necessarily agree with ours? A few weeks ago the long term forecasts that were published may have inclined some of us to not anticipate a period like this one; yet here it is. And it having occurred doesn't mean that the long term forecasts for moisture and temperature aren't, and won't be, accurate. Thanks Cliff. A great post as always. What I find interesting is that during a hot, dry summer like this, we wind up with an August that ranks as one of the wettest. 5th wettest on record as of the 29th, and might see more rain before September starts on Tuesday. Still, I enjoyed the ride in a scary kind of way -- but didn't make my usual hike in the woods with the dogs Fri morning. I have immense respect for the danger of trees during high winds. When I was a young child, a huge oak limb crushed my bedroom back in Michigan during such an early leaf-filled storm. I was thankfully hiding in the bathroom at that time (which is still a good place to hang out during any kind of hairy weather). Another major weather anomaly, another chance to say that this is not from increased atmospheric free energy. Come on, say it Cliff. I want some snow in Seattle this winter, Cliff. Can you deliver? We were heading home from spending the evening with friends in Seattle, just before midnight yesterday (Saturday) - the rain was coming down in buckets in quite a few locations! It wasn't very pleasant to drive in, even if you ignore the multiple accidents we passed heading south on I-5. The NWS missed the forecast on maximum wind gusts by 20-30 mph. They did have the high wind warning but conditions got considerably worse than forecast. I'm in Shoreline and it appears that in this area near the sound, from north Seattle to Everett, conditions were near worst for this storm. What will come next? That's always an unknown. And of course weather.com and some national news didn't mention it much. If Atlanta or NY had 20k without power it would have been huge news. Wow, nice blog! I was up on Whidbey and it was really blowing there.